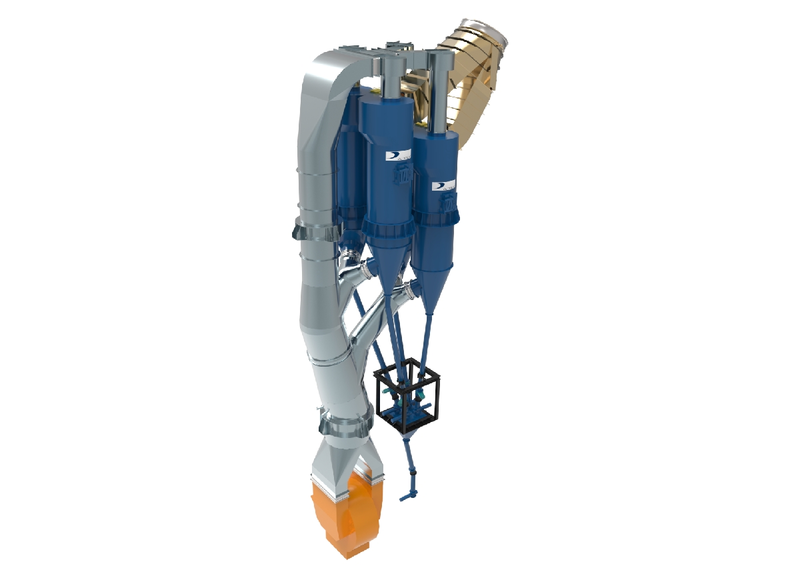 The aim of the OPTICOAL System is a dedusting facility with the objective to substantially reduce the dust content in the hot gases required for the drying and conveying of the final coal at the coal grinding plant. As result of the lower amount of dust the specific heat value of the fine coal will be increased. Therefore an installation of a HURRICLON® with Opticoal System is the best technical solution available on the market. To avoid changes in gas volumes respectively different gas flow in a dedusting cyclone unit due to several reasons (e.g. different moisture content of the raw coal), installing a partial return gas flow to the HURRICLON® to achieve a constant gas flow is foreseen. Separation efficiency of cyclones is highly influenced by the gas velocity. When the gas flow is too low, respectively the gas velocity decreases and the separation efficiency of the cyclone deteriorates. To have a constant gas flow through the cyclone, some of the already dedusted gas is recirculated to the inlet of the HURRICLON®. The amount of the recirculated gas depends on the required gas flow in the coal mill. The variable speed drive of the fan is regulating the amount of recirculated gas. The control loop for the fan is a constant pressure drop after the HURRICLON® system. The advantage of this system is a constant automatically controlled gas flow through the HURRICLON®, ensuring permanent steady separation efficiency.